A rare find. 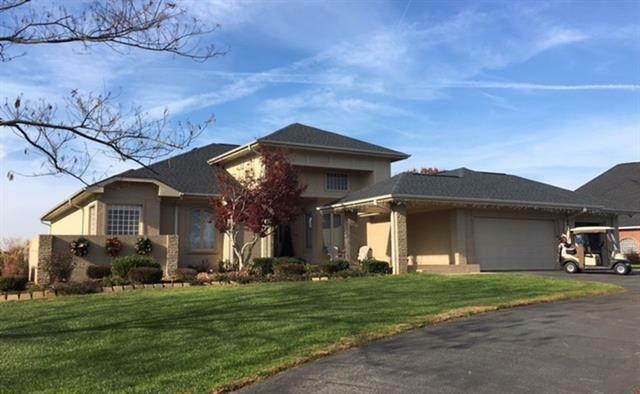 Beautiful custom built home with over 2700 sq ft.- single level home offering 3 bedrooms (can be 4, but currently used as a large office) 2 1/2 baths, located in Rock Barn Golf and Spa. Professional outdoor uplighting, never drive up to a dark home! This home offers beautiful southwest views of the Tom Jackson golf course and the N.C. foothills from the large covered patio (660 SF). The home has a single-level U-shaped floor plan with a private wing for the master bedroom, bath and study. Purchased and completely refinished in 2015. All new appliances, new flooring and fixtures throughout and a new roof in 2016. Enjoy living in this remarkable community offering 2 champion golf courses, a 5 star rated spa with cascading waterfalls, mineral pool and fitness center as well as a tennis facility, outdoor pool and snack bar. 5 restaurants within the community where you can drive your golf cart to the club and enjoy the many activities awaiting you within this gated community.